As I mentioned last month, a legitimate, downloadable, DRM-free version of SimCity 3000 is now available for sale on GOG.com and I was so excited by the news that I just had to get my hands on it. You see, SimCity 3000 is my favourite game in the venerable city builder series and for a long time, it hasn't been available for sale: SimCity 2000 has been available on GOG.com for some time and SimCity 4 has been available on both GOG.com and Steam. So it's been a long wait but I've finally managed to give it a go again. If it weren't for its release, the wait for another retro review to be published on Choicest Games could've been considerably longer. The question is though, can a city builder developed back in the late 1990s (as SimCity 3000) and re-released in the early 2000s (as SimCity 3000 Unlimited) hold up against today's competition? SimCity 3000 has the best soundtrack in the series hands down and is probably one of the strongest motivators for me wanting to even play the game. Yes, the latest SimCity has a pretty good soundtrack and SimCity 4 has some choicest tracks too but when you've got a soundtrack that has jazz music evoking the style of Miles Davis, you know you've got a quality soundtrack on your hands. Best of all, Jerry Martin actually manages to incorporate a SimCity 3000 theme or leitmotif in just about every track. Genius! After playing the recent SimCity, it's refreshing coming back to the old SimCity games where you actually had a considerable amount of land to build your metropolis. 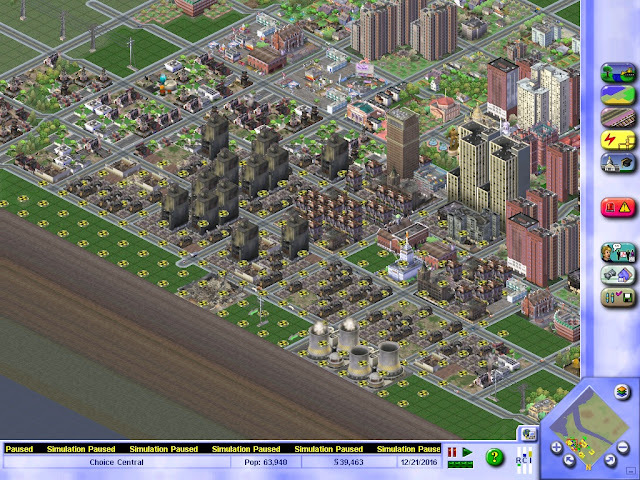 The original SimCity 3000 only had one terrain and architectural style similar to its predecessor SimCity 2000. SimCity 3000 Unlimited however (which is the version that is available on GOG.com) has multiple terrains to pick from and three architectural styles (American, European and Asian). The reason SimCity 3000 is my favourite SimCity is not only because it has huge maps and an excellent soundtrack (although they are compelling reasons on their own) but because the gameplay hits that sweet spot where it's not as basic as the original SimCity but not as complex as SimCity 2000 (with respect to micromanaging industry tax rates) or SimCity 4 (with respect to the managing of multiple cities and the sheer number of options available). While the game looks pretty sweet when you're zoomed all the way out or even at the normal zoom level, if you zoom right in the buildings will look rather pixellated. It's a shame, because if they just did a high definition version of SimCity 3000 the cities would look pretty impressive. The game is pretty old and it becomes quite apparent when you try to use the mousewheel to zoom - that's because it doesn't work! You have to actually hit the zoom in and zoom out buttons in order to change the zoom level. The things you take for granted nowadays. I actually miss the newspapers from SimCity 2000 - it made your city feel more alive as you read what were considered pressing issues by the public and what your current approval rating was at a glance. This has now been replaced by a News Ticker that scrolls across the bottom instead which I guess is more streamlined and less intrusive but it seems to lack character. While the petitioners are good and letting you know about ordinances you could potentially enact and the neighbours are good at letting you know about lucrative deals you can profit from, sometimes it gets annoying when you clearly don't want to agree to the terms yet they keep pestering you with the same propositions anyway. You can't be as brutal with your funding as you were in SimCity 2000. For example, if your city was really small at the start and your citizens demanded police and fire protection, you could build them and then give them only 25% funding. You can't get away with it that easily in SimCity 3000 since they'll know when they're getting underfunded and they'll eventually go on strike. Worse, they won't go back to work until you've given them a pay rise! So when plonking down a police and fire station, don't be cheap. Make sure you can afford the whole package (which means sacrificing the actual coverage radius). The first game I played since getting my hands on the GOG version of SimCity 3000 I had a city that was suffering from heavy pollution problems resulting in occasional toxic cloud disasters. Eventually nuclear power came along and despite the chance of meltdowns occurring I thought they sounded like a great way of getting a lot of power with less air pollution. Unfortunately, what I forgot about (or at least I think this is how it works) is that sources of radiation is a trigger for a UFO invasion - and after one UFO made short work of one of my nuclear power plants, half of my city was a post-apocalyptic wasteland. "I don't want to set the woooooorld oooooon fiiiIIIIRE"
Despite the game showing its age, SimCity 3000 still remains my favourite SimCity game thanks to its jazzy soundtrack and the gameplay hitting the sweet spot so that it's not too simplistic like the original SimCity yet not too complex like SimCity 2000 and especially SimCity 4. Is the game worth $14.99 AUD? : Look, I really love SimCity 3000 but asking $15 for a game that's 16 years old? It's a bit steep. I think $10 would be a fairer price so wait till it goes on sale.